The Quizix QX Series pumps deliver unparalleled accuracy and repeatability - with the superior pulseless metering that is critical for so many of today's production and research environments. Based on an advanced design that includes an innovative valve technology and two independently controlled motor-driven pistons, our pumps set new standards in continuous, pulse-free operation. The QX Series exemplifies what you should demand from a pump: Nothing short of premier performance and an unprecedented array of features for the price. All four models in the QX Series can pump continuously for any length of time, from seconds to months. You can pump fluid at either a constant flow rate or a constant pressure, specifying the precise flow rate or pressure to be maintained. A ramping feature enables the pumps to provide a smooth transition between two rate or pressure settings. QX Series pumps can also operate in either direction, letting you easily deliver or withdraw fluid to or from an application. PumpWorks, Quizix's pump control software, can run up to eight QX Series pumps from a computer in a central or remote location. Using this intuitive program, you can start or stop all pumps in a multi-pump system simultaneously or operate them independently. The four models in the Quizix QX Series provide a wide choice of pressure ratings and flow rates. The QX500 pump offers a maximum pressure rating of 500 PSI (34 bar) and maximum flow rate of 500 ml/minute. The QX1500 has a maximum pressure rating of 1500 PSI (103 bar) and maximum flow rate of 200 ml/minute. The QX6000 delivers a maximum pressure rating of 6000 PSI (413 bar) and maximum flow rate of 50 ml/minute. 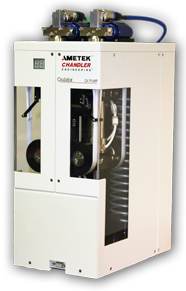 QX20K has a maximum pressure rating of 20,000 PSI and a and maximum flow rate of 7.5 ml/minute. Any of the pumps can be ordered with either Stainless Steel or Hastelloy® (C-276), wetted parts. An additional option is a Wash Area for continual cleaning of the piston. Those who pump extremely corrosive materials may choose either or both Hastelloy and Wash Area options. Whatever model you select, you can be assured of unmatched precision and performance for the long run. Pump manufacturers of all kinds - from HPLC and gear to syringe and reciprocating piston - claim to provide continuous, pulse-free fluid flow. In fact, almost none actually do. We've been manufacturing pulseless pumps for more than three decades. We've learned from experience that the way to deliver pulse-free flow is to incorporate a pre-pressurization phase into each piston stroke, rather than relying on recip­rocating pistons. While one cylinder in our QX Series pumps is delivering fluid, the other cylinder quickly refills and then pre-pressurizes to match the pressure of the first cylinder. A pres­sure transducer on each cylinder, a dedicated microprocessor, and sophisticated software algorithms ensure precise measurement and matching of fluid pressures. As a result, there is no detectable pulse at cylinder switchover. Smooth pulseless fluid flow is further enhanced by our patented valve design. Pre-pressurization also enables Quizix customers to eliminate volume measurement errors due to fluid compressibility. Because the fluid is pre-pressurized before each delivery stroke, it's apparent how much of the stroke is used to actually deliver fluid. Typical HPLC-type pumps cannot differentiate between fluid compression and fluid delivery in each stroke, thereby introducing a source of error in volume measurement. QX Series pumps are remarkable for their wide range of flow rates and the precision of their flow rate settings. Flow rates from 0.0002 ml/minute to 500 ml/minute are available. The pumps' electronically controlled motors let you change flow rates in extremely small increments. QX Series pumps provide exceptionally accurate flow rates (+0.1% of set flow rate) regardless of pressure, temperature, or fluid properties. In addition, PumpWorks software calibrates the flow rate against a distance sensor to ensure extraordinary long-term stability and repeatability. Our years of experience in engineering and building pumps with 20,000 PSI (1,379 bar) capability are evident in the new QX Series design. Quizix patented technology gives you the ability to run at a constant pressure of up to 20,000 PSI (413 bar) without compromising volume measurement or pulselessness. We had your convenience in mind when we designed the QX Series. Running the system is as easy as plugging in the power cord, the computer connection, and the air supply to the valves. The pumps' long-wearing piston seals are readily accessible and easy to replace. An optional washout system cleans any residual material off the piston assemblies, to minimize corrosion and extend life. Our unique valve technology eliminates the major mainteance headaches associated with check valves. The valves in our pumps will operate flawlessly for years. Stainless steel 316 wetted components are standard. HASTELLOY® C-276 is optional.